Sadly, we humans do not treat the animal kingdom with much respect. We pollute the water they live in, we tear down the forests they call home and we poach them for their valuable body parts. The childhood versions of ourselves would not be impressed if they could see how pathetic we have become, endangering every animal’s plight. The Great White Shark is an endangered animal. While it may not be the best-looking or cuddliest creature, no one wants to live in a world without them. There are numerous things you can do to help the Great White Sharks. Don’t order shark fin soup for dinner or support places that stock and serve shark fin soup. Donate a small amount per month or year to a shark conservation fund or trust. Educate yourself and your friends about sharks. Make sure you support marine conservation as the ocean is the sharks home after all. Encourage people to go on shark cage diving expeditions; many of these organisations also support shark conservation. By helping out the sharks, you are ensuring their survival which means you can experience an actual encounter with a Great White Shark . The White Shark Diving Company provides an exciting and enjoyable trip with an unblemished 15 year safety record. 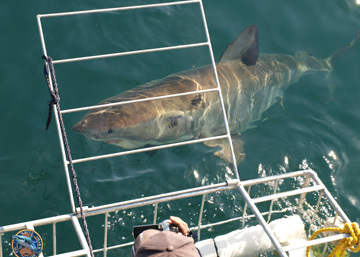 This company prides itself as the only one to offer breaching and cage diving trips at the same time.Like their Facebook page and send them a post telling them why you would like to get up close to the amazing Great Whites and you could receive a free trip for two. Who knows, maybe one of the sharks you see was saved by your compassion.